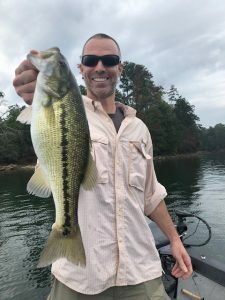 Come enjoy some fantastic Fall fishing! Here are my open dates for October: 29(PM), 31(PM). Nov: 5, 9, 14, 15, 16, 19, 20, 21, 23, 26, 27, 28, 29, 30. 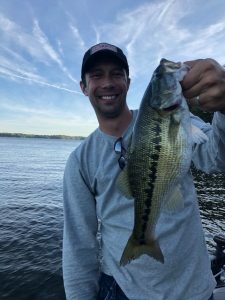 Lot’s of great fishing ahead of us in the coming months, both morning and afternoon! 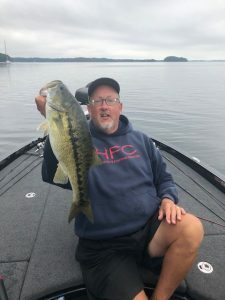 Give me a call and let’s fish! The lake is clear on the lower end, and starting to show some initial signs of turnover at and above Brown’s Bridge. Overall, the lake is in good shape and starting to cool. We have dropped 4 degrees in surface temperature since last week, and will be dropping more with the cold weather. Obviously, the front we have coming in will change things – exactly how is to be determined! That’s what keeps what we do interesting! 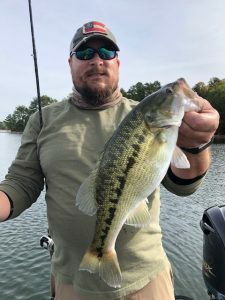 The fish are really in their fall patterns now and we have enjoyed some great results in the last few weeks. The pattern changed a good bit this week from week’s past and we made the adjustment and stayed on ’em! Rock points is where it’s been this week. 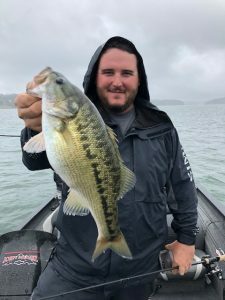 We have been working shallower rocky points with spinnerbaits, crankbaits, jigs, and worms for the majority of our fish. 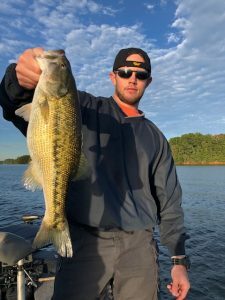 We have enjoyed some topwater activity at times over brush, but the aforementioned baits have ruled. 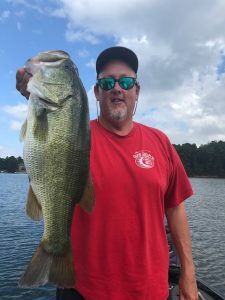 When the fish are active, the spinnerbait and crankbaits are hard to beat. 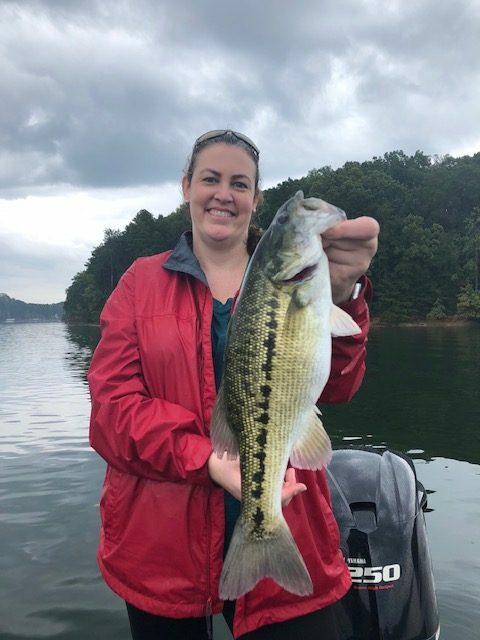 You can cover water quickly and find the aggressive fish. 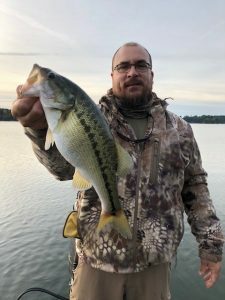 When the bite slows, switch to a worm and jig presentation in those same areas and back out from the shallows. 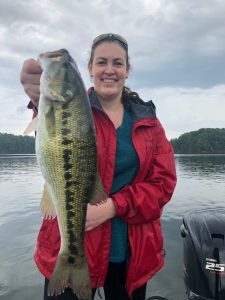 The chasing fish have been in 10 feet or less, and the worm and jig fish have been more in the 12-20 ft. range. 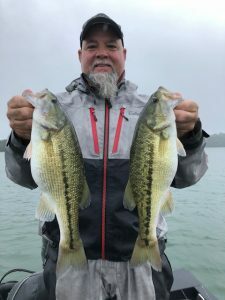 Focus on the shallower rock points in both the mouths of creeks as well as the main lake. Also the mouths of creek pockets in the first half of the major creeks have been productive as well. It is really fun out there right now gang! 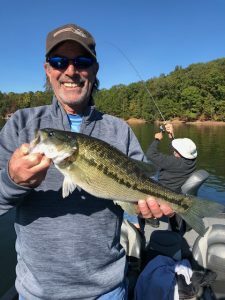 October/November/December are some of my favorite months on the lake – I hope you will make plans to come join me! Come enjoy some fantastic Fall fishing! Here are my open dates for October: 29(PM), 31(PM). Nov: 5, 9, 14, 15, 16, 19, 20, 21, 23, 26, 27, 28, 29, 30. 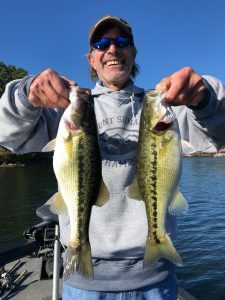 Lot’s of great fishing ahead of us in the coming months, both morning and afternoon! 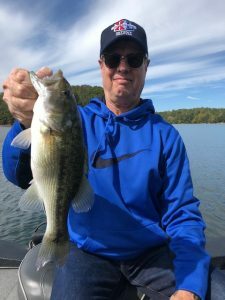 Give me a call and let’s fish! Thanks to all and May God Bless! I have a Hds Carbon setup. 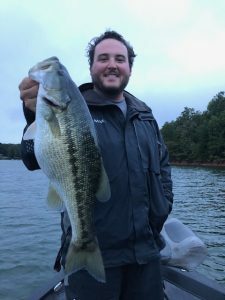 I need help in locating fish on sonar. Could I bring my boat and setup and pay you to teach me?